Front and back covers of the DVD. 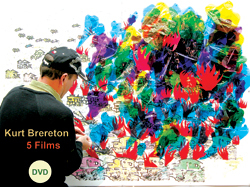 Cost: limited edition of 50 DVDs all signed by the artist= A$ 55 + postage ($5) in Australia or $10 International. Few people venture into the Orphic world of the mangroves. They are not something you pass through on the way to somewhere else. Mangroves demand a quantum leap of entrance, of being inside. And once you have left the familiar solid shore, you must give yourself up to the laws of mud, and mirrored waters. Ghostly white figures of mangrove trees, finger roots and eye socket holes stand prop-like on an estuarine stage. Here imagination follows matter. All life is interconnected, hyper-adaptive and flexible. Temporal and spatial references must be renegotiated. Stillness and patience force an attentive silence and a breathing that is long, slow and deep – in tune with the pulse of the river. 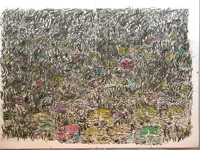 The reward is a gradual introduction to the mangroves as a sympathetic organism – a body with much more going on beneath the surface expanses of dumb mud, reflective pools and unruly trees. 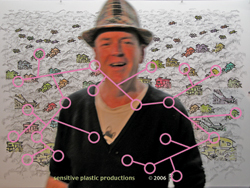 This is a performance drawing animation that includes the artist as a player. You witness the development of the artwork – every step becomes a frame. 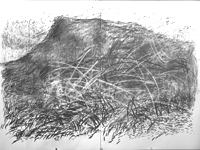 This work is about the art-making process, about the ecological time and the built environment. On a political level, the work shows the loss of the rainforest as the housing projects take over. As a result of global warming and climate change a bushfire is seen rushing through the forest destroying the housing estate in its path. What is left is a burnt out wasteland with only the trace of the estate left behind. The animation is projected onto the gallery next to the large drawing “frame” showing the last arrested end stage. The viewer can witness the history of this estate in an endless loop. Mt Keira is the Mt Fuji of my local landscape. Both mountains are extinct volcanos and both can be seen from the coast. And both are symbolic of nature’s monumental (sublime) beauty and the insignificance of human mortality in the face of such an eternal presence. Our experience of such a monument is made up of a series of views, frame grabs and glimpses. The animation is projected onto the gallery next to the large drawing “frame” showing the last arrested arbitrary end stage. The Fall of Man, or simply The Fall, is a Christian Biblical myth that refers to humanity's fall from a state of innocent bliss to a state of sinful understanding. The cause of this fall was disobedience to God and the result of it was that humankind could no longer remain in God's beautiful Garden of Eden, or walk in the sight of God. Adam and Eve's disobedience and subsequent "expulsion" has continuing consequences for us all being their descendants, who from that time forward must strive and suffer and die. The fall from the garden is also a relevant ecological metaphor for the growing global environmental crisis. Like Adam and Eve, we are in danger of being driven out into a new ecological desert, a new sterility for our collective postindustrial sins. The Fall can also be seen as an aesthetic casting out from the innocence of Modernism and its grand narratives of heroic progress. The artwork on the walls is constantly changing – being cast out of the “garden” studio/gallery. Nothing is permanent; noting exists beyond the moment of the recording eyes of the camera. In the beginning was the blank wall canvas and in the end there remains only a blank wall and empty space.